Welcome to the Le Rouge Robin in the village of Fougax-et-Barrineuf. At the foothills of the Pyrenees, sitting below the Cathar Castle Montsgaur. 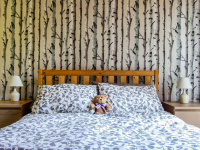 Our family run Gites which accomodate 6 people in each comfortably plus child cot. Outside enjoy your meal looking down the garden to the forest on the other side of the small river. We can also provide boardgames for those winter evenings sat infront of your log fire. Maps of the area are available for you to plan your days. We live next to the Gites and are available to answer questions. The village has a shop where you can purchase your fresh croissants and other essentials, or travel to the next village of Bélesta which has all the amenities. We will provide you with a welcome pack and look forward to meeting you. Our stay was simply wonderful, we spent a charming NY in LRR. 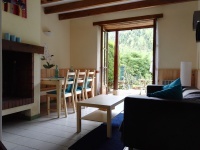 We felt at home ever since we stepped in this lovely gite which had everything we needed. The area is beautiful, if you like the mountains LRR is your perfect HQ, we left some activities for the next time though :) Della and Simon were so nice and helpful to us. The wine, cheese and bread that they gave us on our arrival day were so nice, such a tasty and unexpected present! 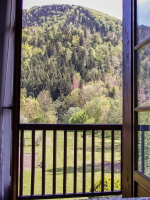 We were delighted when we discovered the place: the view from our is genuinely gorgeous! We enjoyed the warn welcome from Della & Simon, the comfortable place we stayed in (being the cook in the family, I also appreciated the facilities in the kitchen). 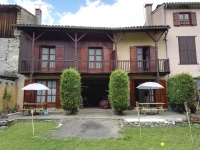 The house is located in a quiet small town in Ariège, close to many interesting attraction points (Montségur, Fontestorbes, Gorges de la Frau...). Recommended!